Legends of Windemere: Allure of the Gypsies Blog Tour Finale! Both brilliant poetry and playful banter! Gotta love these guys/gals! This is a tattered photograph that I have carried around for 43 years since the age of ten. It was retrieved from a scrapbook that my grandma had in an old trunk that held my mother’s personal effects after she died in 1969. The scrapbooks were filled with the sorts of things teenaged girls and young women collect, postcards from places visited, movie and theater tickets, coupons for dancing lessons, pressed corsages, letters exchanged between friends and lovers. On the back it is signed, “Love, Carol.” I don’t know who the intended recipient was supposed to be, but it became the only tangible image of her that I possessed for thirty years. 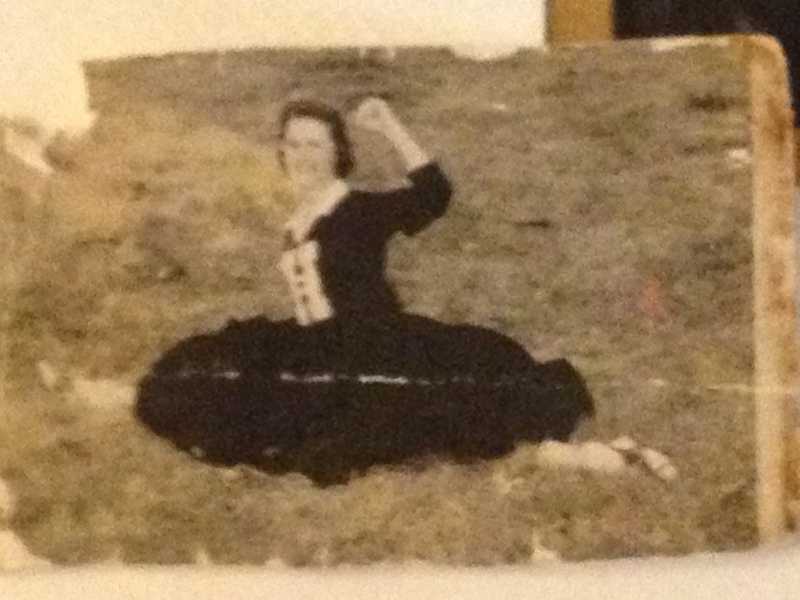 My aunt, my mother’s only sister, had a few photographs. They were mostly small pictures taken in their childhood years and there were only a couple that my aunt had of her sister as an adult. There were other pictures, but they were given to my older sister for safe keeping and we became estranged over the years of separation that followed Mama’s death. In 1997, after coming to Florida and connecting with a cousin, the one who owns Cypress Cove Nudist Resort and Spa, I learned that my uncle, his father, who started the resort back in 1964, had been a photographer with the Miami Herald during the 1950s. When my Aunt Pete, his wife, died in 2000, my cousin was cleaning out boxes in their home and ran across some photographs of my mother and her sister that were taken in their teen years. 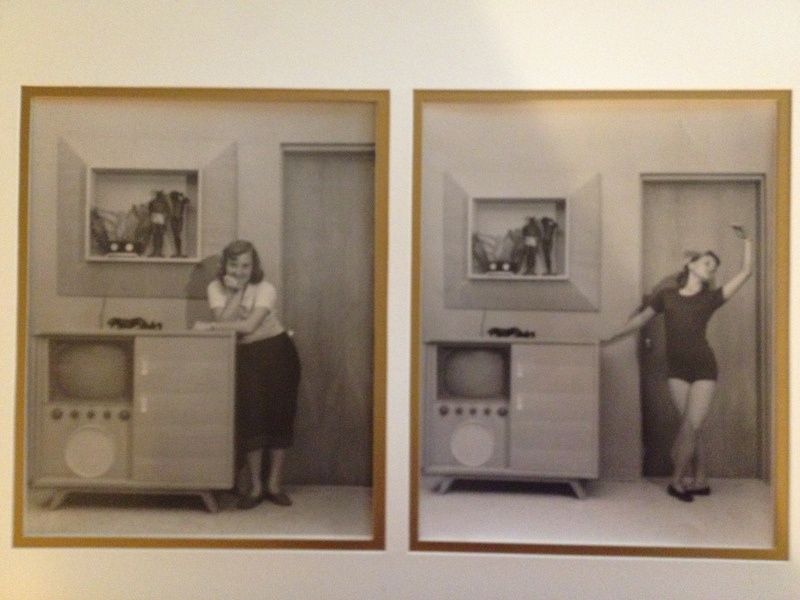 There is now a vast treasure of black and white 8X10s, and smaller photos of the two sisters. I was overjoyed to be gifted this collection and shared them with my mother’s sister, who was also thrilled. I want to ask you to take a look at two sets of these photographs that hang on my wall. You don’t know the story of these sisters, Claudette and Carol, but I would like to ask you to tell me if you see anything that hints of a story in these images. The images alone demonstrate the differences in these two sisters. 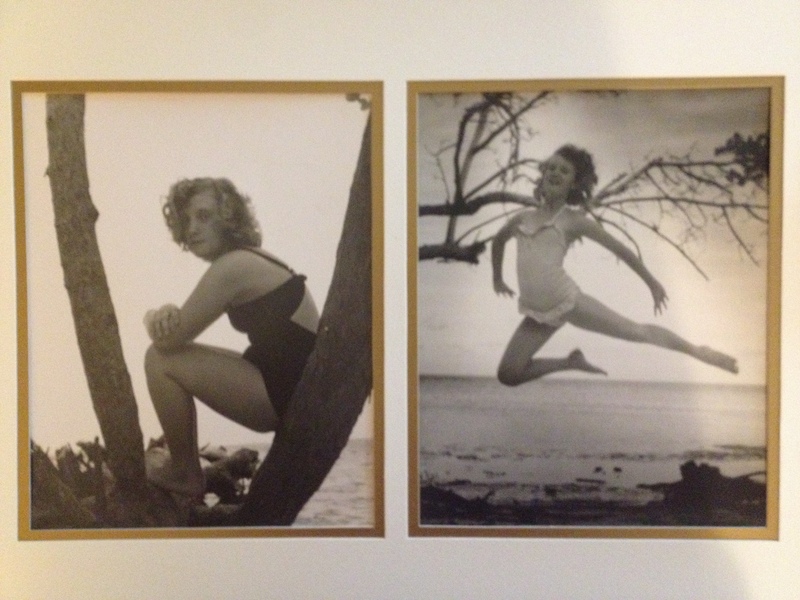 My mother, Carol, a ballerina and dance instructor died of suicide at the age of 26, and Aunt Claudette, a pianist and horticulturist, is 74 years old now. Carol was a hopeless romantic and a dreamer, and Claudette was a hopeful realist and pragmatic. Carol was cosmopolitan and sophisticated. Claudette was countrified and domestic. Carol, a soprano. Claudette, an alto. Carol was open and free-spirited. Claudette was closed and restrained. As young adults, Carol was dressed in stockings and heels, and Claudette wore jeans and penny loafers. Both were well educated and cultured in their youth, but their childhoods, teen years, and young adult lives were tumultuous. Music and dance were where they mutually sought solace. That side of my family is riddled with mental illness and addiction. Of all the many cousins and aunts and uncles on my maternal side of the family there are geniuses who became entrepreneurial millionaires, and there are paupers who suffered epilepsy, neurological conditions, psychiatric disturbances, multiple tragedies, became institutionalized, or died trying to overcome the obstacle that is madness. There is a fine line between madness and genius. Mental illness and neurological disorders were cloaked in a veil of secrecy in their era and still have a degree of stigma associated with them that needs to be overcome. Very few were able to walk the middle of the road, but the strength found in faith, time, and modern science and medicine has made a huge impact. My aunt is one of those who did, although she had severe issues with bipolar and addictions. I had a brief adventure with drugs and alcohol between the ages of 17 & 19, but addiction was never a problem for me. I was hospitalized for an acute psychotic episode when I was 19, and have been on medications for bipolar and in therapy ever since that event. I drink socially on rare occasions but the experiences of me and my aunt have paralleled many times…either on a personal level, vicariously, or through my patients in my nursing career. My moods are relatively stable now. I am still “driven” at times and “depressed” at times, not to extremes, but such has not always been the case. I would like to tell my story someday, but not before I tell the story of the two sisters, my mother and my aunt. When I wrote “Red Clay and Roses”, I was telling a story that was wrought with historical tragedy and the serious issues of racial tension and reproductive rights and responsibilities. I wrote passionately about events I witnessed personally or events that had been shared with me by others who had lived the experiences. I did not set out to write a novel by a specific formula or template. I documented a harsh reality. It was open and candid. I have never been one to shy away from that which is painful or shameful. A wounded society does not heal itself by looking the other way, and neither do individuals. At the same time, I tried to be as unbiased as possible and approach these unapproachable issues with sensitivity. On that level, I feel it was successful. In addition to numerous short stories, I have three works in progress. One is a crime novel. I am about 30,000 words into it and my husband, who reads them daily, loves it. I feel that it is superficial and shallow, amusing and entertaining in its own way, but I am not certain that it carries the weight that makes me comfortable in my own writing skin. Another is a murder mystery. It is more a psycho thriller than a crime novel and I am about 15,000 words into it. I liked the beginning of it, but it doesn’t seem to be going in the direction that I planned for it. Sort of hard to explain, but it, again, doesn’t flow with the passion from the pen that I feel most comfortable with…it feels forced and I am beginning to see that in the way that it reads. At any rate, I am not so sure that this genre of crime/murder is where I need to be right now. I don’t feel like I am in my element. Perhaps this is something that I can come back to at some future point. The final work is an autobiography of sorts that is almost unbelievable as a memoir. It is a complex life that I have lived in foster care, an orphanage, on the street, in the islands, small town USA, the countryside, the nudist resort, and the big city. So I am not sure what to do with this either, whether to continue it or shelf it for a while. Which brings me to questions that I need your help with. It seems to be the passion that I felt when writing “Red Clay and Roses” that I am missing. For those of you who have read “Red Clay and Roses” (A fictionalized true story set in the 1950s-60s, but involving relatives on my father’s side of the family), you already know that Carol is mentioned twice in that story…once by Hannah in relating her memories of her mother and her mother’s death, and again by her cousin, Sybil, in relating the death by suicide of her cousin, Henry’s, wife, leaving three little girls with no mother. If I decide to write this book, I would approach the writing process much differently, not as a fictionalized true story being told to a narrator, but as pure fiction (which is always, in part, based on some truth). Without knowing the details, do you think the story of Claudette and Carol is one that you would find interesting? Particularly, how Claudette coped in the long run to turn her life around. I have been all over Amazon reviews this past week and there seems to be quite a market for this sort of thing as well as the era…people are saying that they are too old to enjoy the drama of Paris Hilton, and too young to relate to the 1930s and 40s, about which so much is written. Finding and connecting with these people will be another challenge. People my age and ten years older are beginning to retire, have the time to read, and they are dissatisfied with what is on the market. As a family saga, beginning in the mid-fifties and moving into the mid-nineties, do you think this story would make a worthy sequel to “Red Clay and Roses”? For those who have not read “Red Clay and Roses”, what are your thoughts about “Surviving Sister: A Melody of Madness”? A very dear friend has started a poetry blog and she needs you. I’ve been trying to write more and more poetry. Some of it is good, some not as much. But I’m learning and trying to do more. What I would like to do though is increase my readership. May I ask that if you like a particular poem, would you please re-blog it for me? That may get me more eyes and hopefully a few more followers. I don’t get too worried about how many followers and my stats, but I would like to increase a tiny bit. So I hope it isn’t inappropriate for me to ask you to give me a hand. Much appreciated. Thank you. 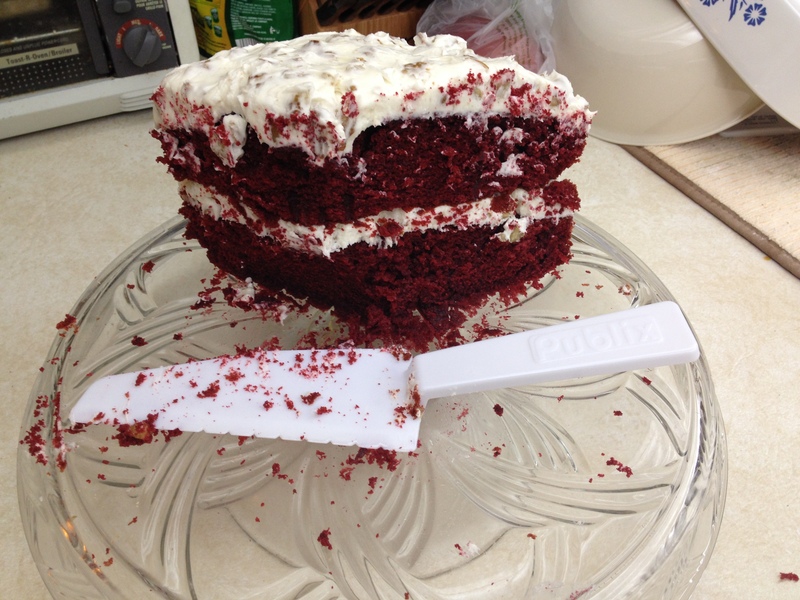 What’s left of Grandmother’s red velvet cake this morning. I wanted a pic before it was cut but nobody could wait. Grandmother, Barbara Holland Koone, never made anything by a recipe. It was a handful of this and a pinch of that, a cup, a spoonful and a dribble. Everything was made from scratch. In her late eighties, we granddaughters convinced her to measure her favorites and write down the recipes for us. She agreed to give us one recipe each. We had to choose only one. I had not planned to post this week, but this is my gift to you. Being the best cook in three counties, with the County Fair ribbons to prove it, picking just one recipe was difficult for some. Not me, I wanted the Red Velvet Cake recipe. I watched her pinch and pour and measure as she prepared this recipe for me and demonstrated how to prepare this cake. Now, I make these every Christmas without fail, a holiday tradition. Preheat oven to 350 degrees and grease and flour two cake pans. You will need two large mixing bowls. Sift dry ingredients together in a large mixing bowl. Sift them a second time. Mix the wet ingredients together with the sugar on low for two minutes. Spoon the sifted dry ingredients by large spoonful gradually into the wet mix taking care to thoroughly mix before adding another large spoonful. This will take about three minutes of mixing. Once thoroughly mixed, pour half batter into each of the greased and floured cake pans. Bake for 25 minutes or until toothpick comes out clean. Take care not to overcook browning the edges. Turn out onto rack and let cool before frosting. Mix all ingredients on high then fold in the nuts. Spread half over top of bottom layer and place top layer onto this, spread remainder on top. No need to frost the sides. If you have had red velvet cake in a restaurant and did not like it, you will be surprised at how moist and delicious this cake is. Also, the cream cheese frosting with pecans makes the cake. 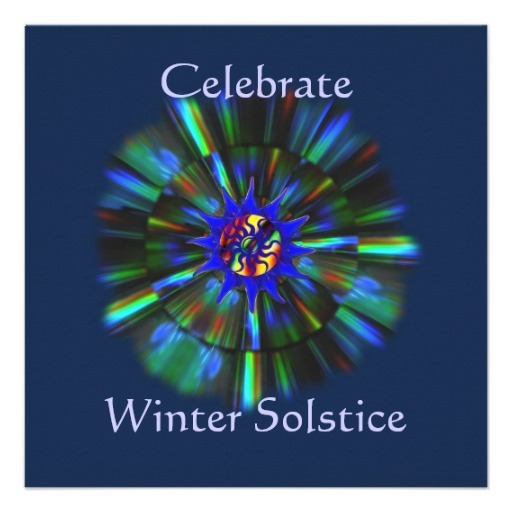 The season officially changes today to wintertime with the Winter Solstice celebration. This marks the beginning of our snowbird season. Tonight our friends meet at a home and gather around the fire pit. We draw a card from a deck. The host has a different deck and he draws out a card from his deck. Whoever has the matching card picks a gift and then the next person can choose to take a gift from someone else or pick a new gift. The gifts are sometimes very nice ones, but most of the time they are gag gifts or something really unusual. Sometimes you end up going home with what you brought. There is laughter and a whole year of stories to tell. The party has all of the usual party favorites, food and drinks. There is soft music and dance music, but mostly it is a celebration of the season. We have a mild seasonal change here in Florida at wintertime with cooler temperatures in the daytime and at night. It can get quite cold here in Central FL in January and February. It is often a wet and windy cold. For us, the Winter Solstice is not so much about winter spirits, frost, snow, sleet, ice and frigid temperatures. It is more about the return of folk from up north. The snowbird friends are back for the season and there is a sense of joy and happiness in meeting these people again. The streets are busier and the community has a temporary growth. Reuniting and spiritually reconnecting with old friends and knowing that they are safe and healthy brings us a sense of peace and pleasure. The return of the snowbirds, who stay from winter till spring, is the primary cause for our celebration. We are glad to see them return, year after year. However you celebrate the coming of the winter season in your community, I wish you joy! Have a Merry Christmas and a Happy New Year! Have a Happy Holiday season ! We will be celebrating Christmas with my daughter and her family and my stepson on Sunday. Then, we are off to Naples to visit more family and play on the boat while a friend house sits for us and tends to the dogs, cat, and bird. I will not be posting next week, but may be checking your posts and making some comments via the iPad. The publishing debut by Papi Z from The Literary Syndicate! 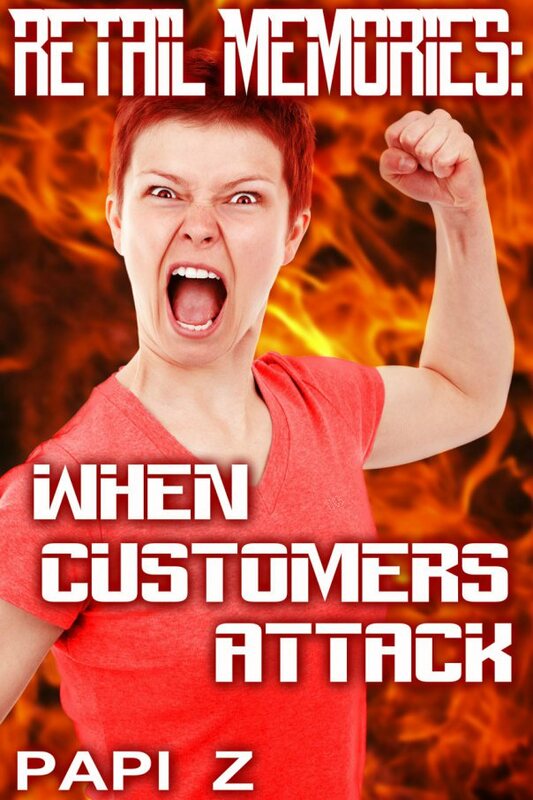 Retail Memories: When Customers Attack is a highly fictionalized memoir of Papi Z’s retail years. Filled with humor, horror, and gift-wrap murder, this is a must have book for your holiday! It will be available for Amazon Kindle for $.99. The perfect stocking stuffer gift idea for that hard-to-buy-for retail-working family member! Anticipated sale date the week of 12-23-13. Basking in the glow of memories both good and bad, Papi Z takes you on a highly fictionalized whirlwind tour of retail life from the perspective of store management. Hostile customers, vermin, and misadventures await you as Papi Z escorts you through the dark times of Christmas and various other situations. Papi Z was born many moons ago on a planet far, far away. Sent to Earth at an early age to assist humanity in retail related manners, he thankfully has left the retail life and founded The Literary Syndicate. He currently lives on Earth with a wife and daughter. Fauxpocalypse, a collection of original short fiction, went live on Amazon Kindle at noon today. This is the culmination of an idea that I had just about a year ago. Two ideas, really. The first was about the theme of the end of the world in literature, and that I couldn’t recall any stories about what would happen if the end of the world was predicted, but failed to materialize. So I set out to write one, and then I realized that I really wanted to read other people’s stories on that theme. That led to my second idea. What if, I wondered, I opened up the world I was working on to contributions from all over the internet? Like a rock hound, I seek out Florida’s hidden gems. This rare gem is tucked away behind the curtains of Spanish moss that drape a live oak shaded cobbled avenue in Winter Park. The museum and its impressive art nouveau collection is the crown jewel of the Winter Park shopping and historic district near Orlando. If you are ever in the Orlando area the museum is simply a “must see”. 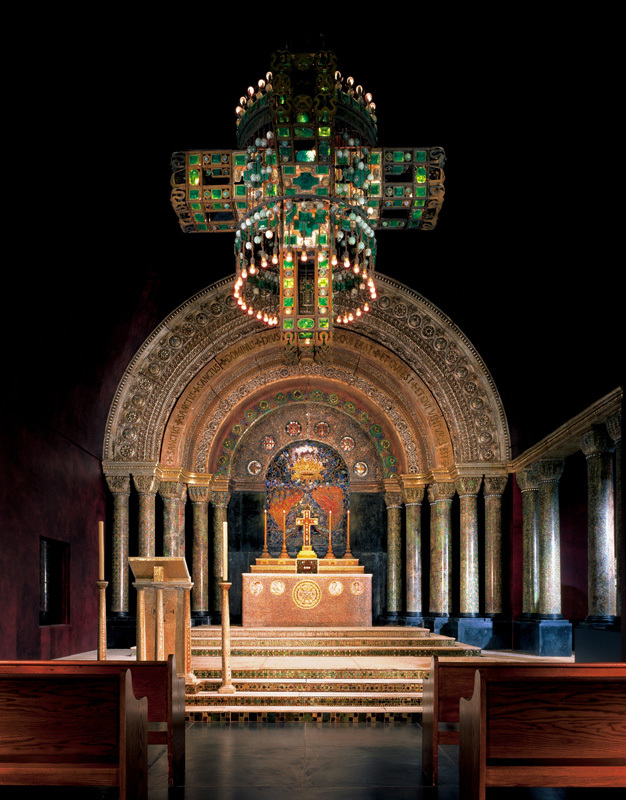 Its focal point, a chapel rescued from the fire that destroyed the Tiffany Estate, Laurelton Hall, in 1957, was designed and constructed exclusively for display in 1893 at the World’s Columbian Exposition (also known as The World’s Fair) in Chicago. The chapel is made of mosaic glass tiles that reflect patterns of colored light from every angle. The cross shaped “electrolier”, as Tiffany called it, is suspended above. Another Tiffany masterpiece, The Daffodil Terrace, restored at the museum, is temporarily installed at the Metropolitan Museum and is larger than many Manhattan apartments. Its tall marble columns are topped with clusters of yellow flowers — daffodils — made of blown glass, the material in which Tiffany achieved his greatest eloquence. The Daffodil Terrace once connected the dining room and the gardens at Laurelton Hall, the grand estate that Tiffany built for himself from 1902 to 1905 on 580 extensively landscaped acres overlooking Long Island Sound. Can you imagine the grandeur of such a place? ANYONE INTERESTED IN SCRIVENER? This is the best class ever, offered by Gwen Hernandez, author of “Scrivener for Dummies”. Just forty bucks and you will learn so much, even if you think you already know Scrivener! Six Weeks of step by step, great for beginners OR the seasoned scribe. Mac or Windows! Registration for my February Scrivener online courses for Mac and Windows is now open. Both start February 24th. For more information, or to register, click one of the buttons below.